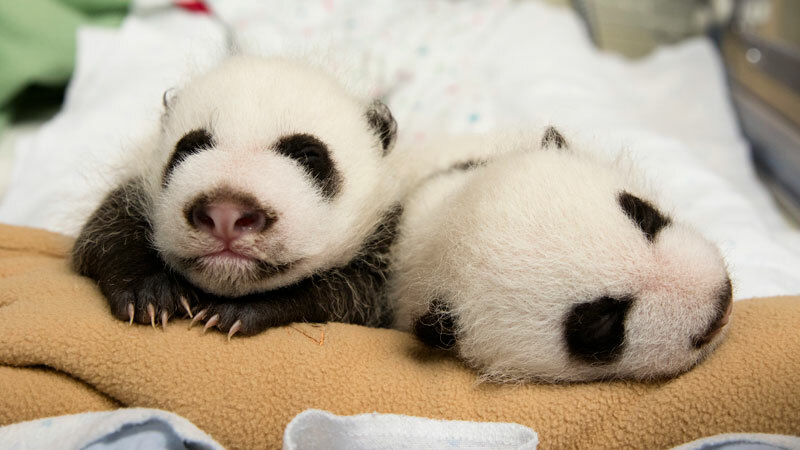 On September 3, Lun Lun, a giant panda at Zoo Atlanta , gave birth to her second set of twins. We wanted to know what it was like to help care for the animals, so we asked a keeper for a few details. 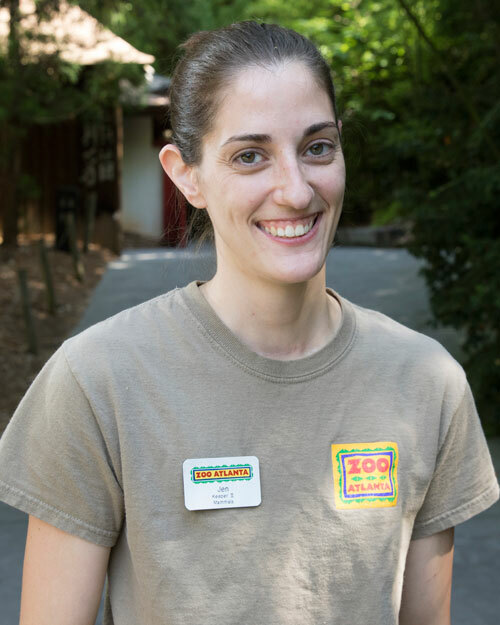 Jen Webb has been a Mammal Keeper in Zoo Atlanta's Carnivore Department for over five years. A Georgia native from Fayette County, Webb says working at the major zoo in her home state is pretty awesome, and is lucky to work with pandas. "I've known my whole life I'd make a career working with wildlife, but I never knew in what capacity," Webb said. "Truthfully, zookeeping wasn't even on my radar until I took a Zoo Biology class (through Georgia State University) and completed an internship at Zoo Atlanta my senior year in college. I quickly fell in love with the field." I have a Bachelor of Science degree, as do virtually all professional zookeepers, in Biology from Clayton State University. Other keepers have majors in Zoology, Animal Behavior, Wildlife Management, Psychology, or other fields. My responsibilities are vast, and the job isn't always glamorous, but zookeeping combines my two loves in life: working with wildlife and teaching. As a zookeeper my main job is the day-to-day care of the animals I work with. This includes cleaning their daytime and nighttime areas; feeding; habitat maintenance; animal training (all voluntary on the animals' part and by use of positive reinforcement); providing enrichment (ways to stimulate the animals and their natural instincts); educating guests through keeper talks; research; and assisting in veterinary procedures. I got very lucky! I started working as a seasonal keeper in the Bird Department and the Primate Department, but it was temporary full-time work. So I kept applying for every permanent full-time position that became available. I wanted to work with carnivores, so the position with giant pandas seemed perfect since giant pandas fall under our Carnivore Department. Giant pandas are very charismatic, adorable, popular animals. And not every zoo has them! Only four zoos in the U.S. house giant pandas on loan from China— including the San Diego Zoo , another great CityPASS partner. Giant pandas are also notorious for being a difficult species to breed, as females are fertile only under very specific conditions and for a very, very short amount of time. This, and their appearance, makes giant panda births very popular! Giant pandas are also a rare species in general. It's not as likely that any of our visitors will see giant pandas in the wild in China, so the excitement around giant panda births also helps to make the connection between the individuals who are part of our giant panda program here at the Zoo and their wild counterparts, who are very reliant on conservation programs like the one of which Zoo Atlanta is part. 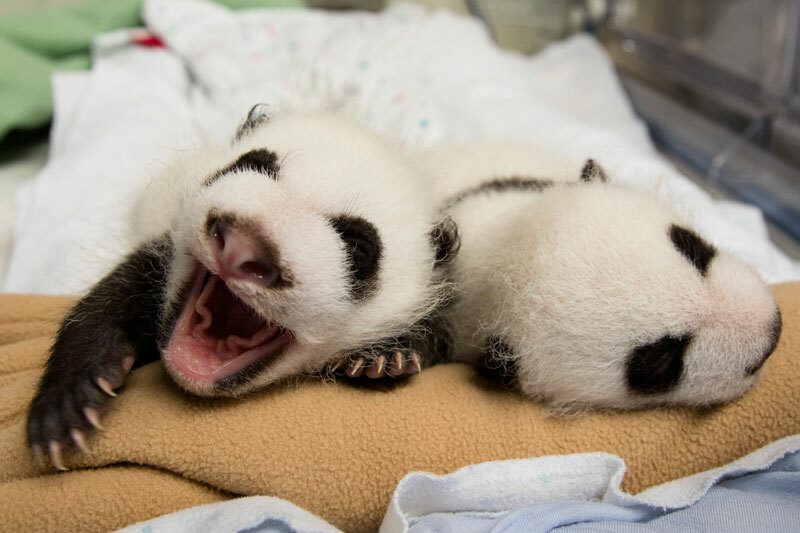 Giant pandas are born very, very altricial (underdeveloped). Babies are 1,000 times smaller than their moms at birth. They are about the size of a stick of butter, weigh only a few ounces, and are blind, deaf, unable to walk, and unable to regulate their own body temperature. For these reasons, they have to be held continuously for the first month or so, or otherwise they will freeze to death. So it's hard for Mom to take care of two babies. Because of this, while twins occur about 50 percent of the time, usually one is abandoned in the wild. In a zoological setting, the caretakers can step in and keep one of the cubs warm in an incubator until it's the cub's turn to spend some time with Mom bonding and nursing. (It's) very busy! For the first four or five months, we have keepers and a colleague from China in the building 24/7 to keep an eye on the baby (ies) and Mom. This is to ensure that Mom is getting enough food and care she needs to care for her cub(s), and to ensure that the cub(s) are growing and developing normally. Once the cub(s) are around 5 months old, their immune systems are strong enough that they can be exposed to other areas of the panda building where our other pandas spend time. This is when visitors gets to lay their eyes on the new nugget(s) for the first time. After that, the keepers are still busy providing Mom with an endless supply of bamboo and making sure the cub(s) doesn't get into too much mischief! Their fur is quite wooly, and these animals, even when small, are very dense and solidly built. Cubs in the wild spend most of the day sleeping in a tree while Mom forages for bamboo. So they have a very strong grip! Even at 8 months old, the cubs are difficult to handle safely so we only do it when needed. After the cub(s) are a year old they're too strong! Like all of the animals here at Zoo Atlanta, the cubs and Lun Lun are treated as wild animals, so to preserve and encourage their important natural behaviors, our team handles the cubs as infrequently as possible, and only for very specific reasons. Each cub is unique. Sometimes there are visual markers you can use to tell them apart. For example, currently, Cub A has more black fur around its mouth and nose than its sibling does. But visual markers change as the pandas grow. So the best way to tell them apart is by their ever-evolving personalities. Cub A is definitely the fussier one. Also, each cub has its own designated incubator. With our first set of twins born in 2013, we shaved a small patch of fur between the shoulder blades of one cub while we were still handling them. This made it very easy to tell them apart. Lun Lun is a very attentive mother. She cares for each cub equally. She is very quick to respond whenever they vocalize, whether it's because they're hungry, want to snuggle closer, or need to be stimulated to go to the bathroom. While we do approach her care as that of a wild animal, Lun Lun has developed positive relationships with us, her keepers. She will shift into another den to allow us to swap cubs, and if she doesn't want to do that she will allow us to trade her a cub for a treat and another cub. When there are twins, our job is to make sure Lun Lun and the cub she has are being attended to, and to ensure that the cub hanging out in the incubator is comfortable and not getting too hungry. We start with swaps every two hours, and gradually increase the time between swaps as the cubs grow. Once they can regulate their own temperatures, we give Lun Lun both her cubs and she is able to care for them on her own. The keepers tell their favorites through trial and error. All scents have been approved by our veterinarians. So even if the animal ingests the scent, it won't cause them harm. Once we had an assortment of scents, we started offering the pandas each scent. Some they reacted strongly to (rubbing it all over their bodies, called "self-anointing"), while other scents they weren't that impressed with. The twins will stay together as long as they are happy being together. This will last until they are sexually mature. Once they're sexually mature, they will naturally want to lead solitary lives. All of our offspring return to China as part of our loan agreement. They return to the Chengdu Research Base of Giant Panda Breeding, which is where their parents were born, around the age of 3 and will remain together until they're sexually mature. Guests can currently see Yang Yang (the father of all the cubs), and the first set of twins born in 2013: Mei Lun and Mei Huan. We have a monitor in the panda viewing area where visitors can see Lun Lun with her cub. However, they will not make their debut until December 2016 or January 2017. In this coming November, the 2013 twins will make their journey to China as have all of their older siblings. So, for a small period of time, guests will only see Yang Yang. Watch how the pandas eat! They have a very strong sense of smell and powerful jaw muscles. They only eat the pieces of bamboo that smell the "best." They're actually smelling for sugar/starch content. So every time they take a bite, you'll notice they'll hold the bamboo in front of their noses – that's when they're smelling to see if they want to take another bite, or if it's time to try another piece. They're very picky! Being a zookeeper is a very hard job and at times quite dirty … but's also a very rewarding job! It never ceases to amaze me with the relationships we are able to build with these animals. Everything we ask them to do is voluntary, and they always have a choice. So to see them actually do what we ask is pretty cool! I'd also like to add that while giant pandas are definitely one of the most popular species here at the Zoo, they're also part of a very important conservation program. 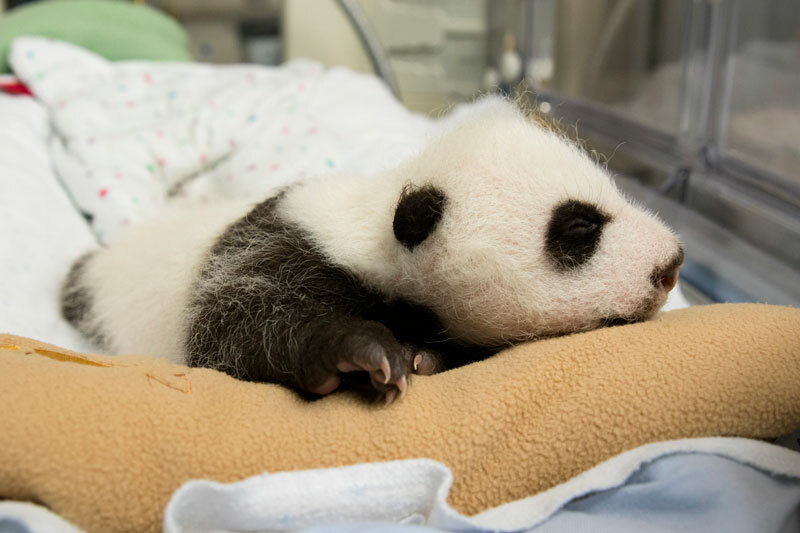 Zoo Atlanta has contributed over $10 million in conservation funding for giant pandas in the wild in China. Supporting the Zoo helps us continue to make a difference with these long-term investments for the benefit of wild populations. 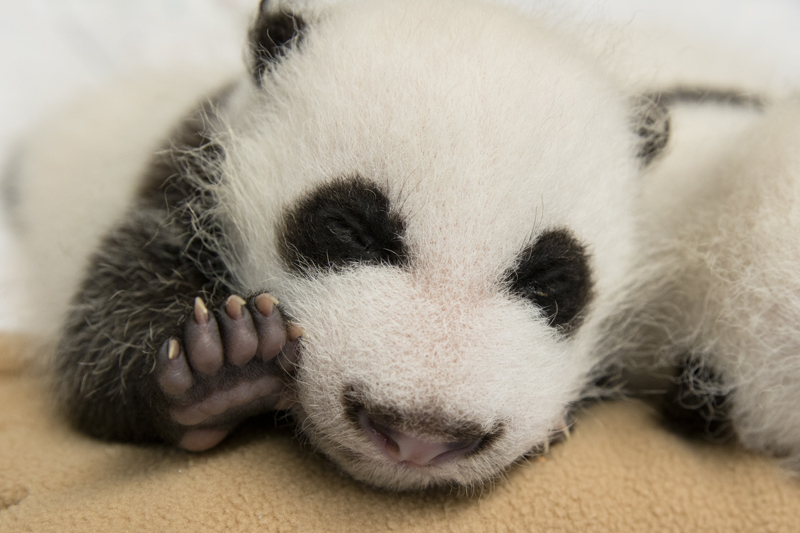 Chinese tradition maintains that giant panda cubs are named when they reach 100 days of age. All five of Lun Lun's and Yang Yang's previous offspring were named according to this tradition, and while there are no firm plans yet for their naming, we expect that the new cubs will be named following this custom. All plans will be based on the cubs' level of development and Lun Lun's comfort level in taking the cubs with her into new areas, but we are hopeful that Members and guests will be able to see the twins in December 2016 or January 2017. Three-year-old giant panda twins, Mei Lun and Mei Huan, the first pair of surviving giant panda twins in the U.S., are expected to leave Atlanta for the Chengdu Research Base of Giant Panda Breeding in China in November 2016. To visit the Zoo and other top Atlanta attractions, explore the Atlanta CityPASS .